David Hoffman is the Emmy Award-winning President Emeritus and founder of Internews, a global non-profit that has pioneered media development and independent journalism. Internews has helped build thousands of television and radio stations in more than ninety countries. 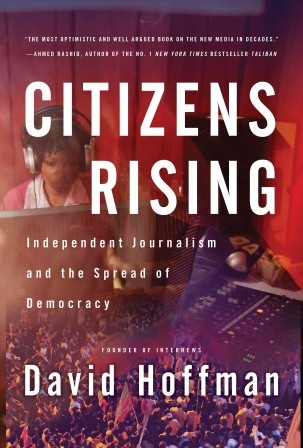 He is the author of Citizens Rising: Independent Journalism and the Spread of Democracy. Last modified on 2018-03-22 12:48:25 GMT. 0 comments. Top. “David Hoffman has written a stirring book. He shows how digital technology grants a voice to citizens, threatens the most brutal dictators, and, however unevenly, promises a better tomorrow.” – Ken Auletta, Columnist, The New Yorker. The rise of digital technology has put the power of the media to intervene in global affairs in everyone’s hands – including yours. David Hoffman, founder and CEO of Internews, the world’s largest non-governmental media development organization, explores the role factors like India’s spectacular mobile phone penetration and China’s half a billion strong online population play in directing and reinventing development and governance in the region and in the world. Drawing upon his personal experience in countries such as Kenya and Afghanistan, and working with successful activists/entrepreneurs such as Mir Ibrahim Rahman of Pakistan’s Geo TV, Sai Zom of Myanmar’s SkyNet, and many others, Hoffman shows the potential of new media—to effectively prevent conflict, facilitate free elections, expose corruption, promote nation-building, provide critical information amid natural disasters, and bring about massive social change such as free education and women’s rights.